Below: You can monitor ferry movements from Goodwick Moor Nature Reserve! Wondering what on earth to do with the children after arriving far too early for your ferry to Ireland from Fishguard should never be a problem - take them just up the road to see Goodwick Moor Nature Reserve. 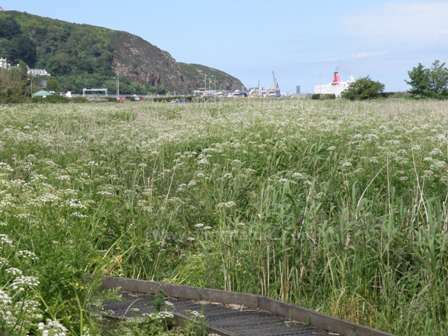 This lovely site, managed by the Wildlife Trust of South and West Wales, has a wealth of wildlife and easy access from the main road that runs down from Fishguard to the ferry port. You can even monitor the arrival and departures of the ferries from vantage points on the boardwalk in the reserve! It's a wonderful place to visit in the summer, but even in winter you may be lucky enough to catch sight of or at least to hear some of the unusual birds that have been recorded there - Cetti's Warbler, Snipe, Siskin and Bittern have all been known to over-winter on the reserve. 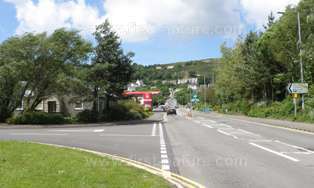 From Fishguard take the A4971 road signed towards Goodwick and the Ferry Port. Just before the A40 roundabout there is a right hand turn into a parking area called Marine Walk, where you can leave your car and walk down the steps from the car park, across the road and into the reserve via its main entrance which is to the left of the Sea View Hotel. Unfortunately the sign for the Marine Walk car park is difficult to spot when approaching from Fishguard, but if you miss the entrance, simply drive around the roundabout and back up towards Fishguard for about 150 metres before turning left into the car park. 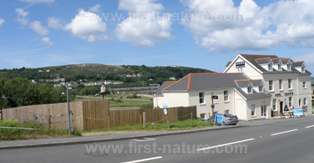 The other entrance to the Nature Reserve is off the A40 road running from the A40/A4971 roundabout northwards towards Goodwick and the Ferry Port. There is a large car park signed off to the left just before the Goodwick Sea Scouts building and the petrol station, both on the left-hand side of the road. The car park is signed 'Goodwick Moor'. There is a direct entrance to the nature reserve via a level, tarmac path from the car park. This path eventually joins up with a boardwalk which is also accessible from the main entrance - see above. 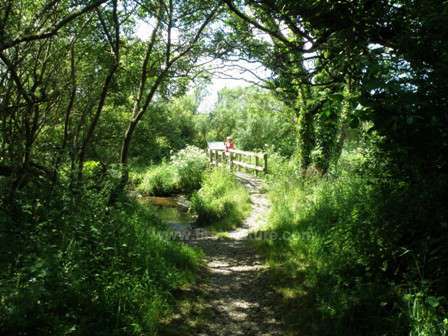 There are excellent paths throughout the nature reserve. The tarmac path leading from the Goodwick Moor Car Park (described above) is suitable for a walk with prams and accessible for wheelchair users. During winter months or in very wet weather that coincides with spring tides, the whole of the nature reserve, which lies on a flood plain, can be under water and so you should turn back if the site is waterlogged. There is an information board located close to the main entrance of the reserve. There are cafes, shops and public toilets in the ferry harbour area. We last visited this lovely nature reserve in mid-June, and we were delighted to hear the call of a Cetti's Warbler (Cettia cetti). The extensive reedbeds also support breeding populations of Reed Warblers (Acrocephalus scirpaceus) and Sedge Warblers (Acrocephalus schoenobaenus). Swallows (Hirundo rustica) swoop over the reserve during the day and roost nearby at night. The call of numerous Stonechats (Saxicola torquata), so reminiscent of pebbles being banged together, accompanies your walk through the reserve in summer. On a recent visit we watched a solitary Red Kite (Milvus milvus) circling overhead, but other birds of prey known to hunt at Goodwick Moor include Kestrels (Falco tinnunculus), Buzzards (Buteo buteo) and Sparrowhawks (Accipiter nisus). Plantlife at Goodwick Moor is also excellent with some very special species putting in an appearance: Royal Fern, one of our most beautiful and regal-looking wetland plants, grows here along with the gorgeous Bogbean (Menyanthes trifoliata) which is so much more glamorous than its name implies: early spring is the time to see its frothy white flowers. Later in the year it is followed by Sea Aster, Water Mint, Branched Burr Reed and Glaucous Bulrush (Schoenoplectus lacustris). 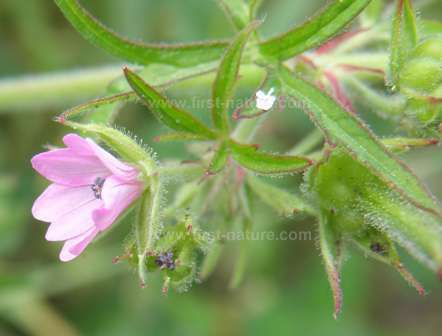 On the edges of the paths there are huge swathes of Foxglove (Digitalis purpurea), Red Campion (Silene dioica), Yellow Flag Iris (Iris pseudacorus) and Ragged Robin (Lychnis flos-cuculi) to admire, and also some smaller, but no less charming, flowers such as Cut-leaved Cranesbill (Geranium dissectum) with its distinctive, deeply dissected leaves and tiny pink flowers. The good summer plantlife and abundant flowers at Goodwick Moor mean that there are also plenty of dragonflies and damselflies there and plenty of butterflies and moths, too. The dragonflies include the Broad-bodied Chaser (Libellula depressa), Emperor (Anax imperator) and Southern Hawker (Aeschna cyanea). Painted Lady (Cynthia cardui), Comma (Polygonia c-album) and Ringlet (Aphantopus hyperantus) are intresting butterflies to look out fo,r having all been recorded on the reserve. Frogs and toads make their homes at Goodwick Moor, and reptiles are spotted from time to time too. Both Grass Snakes (Natrix natrix) and Adders (Vipera berus) have been seen there. As if this were not enough, Otters (Lutra lutra) and Water Voles (Arvicola terrestris) also live at Goodwick Moor Nature Reserve.